Thanks to everyone that made our 2011 season a sucess !! We will be preparing for the 2012 season in early spring!!! 2012 Harvest Date will be set for Sept. 2012. Check back for updates and exact harvest date. After 3 months measure 8-9"
2007 season proved to be a our best year as we harvested 1020 pounds from our 3 ponds. and finally into a large catch tub. Hello all we had a great harvest on Sunday Sept. 25th. 2011 pricing was 11 per lb. for orders of 1 lb. thru 9 lbs. example 6 lbs.= $66. OR If you order 10 lbs. or more they will be $10. per lb. example 12 lbs.= $120. Thanks to everyone, we look forward to seeing our loyal customers and new ones!!! 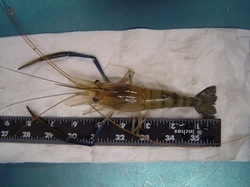 This was our 7th year raisning prawn/shrimp. 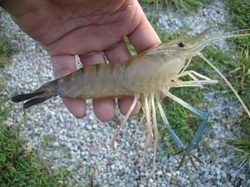 Shrimp season will begin again around the last weekend in May or the first weekend in June. 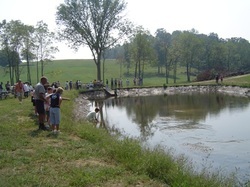 This is when the juvenile shrimp will be introduced into the ponds. 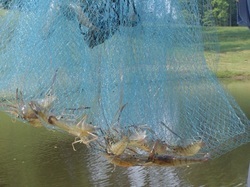 Prawns/shrimp will be ready for harvest in September. Our next harvest will be in Sept. 2012.